We began this hike from the Davis Path parking lot on Route 302 in Hart’s Location, New Hampshire. We followed Davis Path to Giant Stairs spur trail and slept at the established tent site on the top of Stairs Mountain. In the morning we returned to Davis Path and followed it to Mount Davis where we took the spur path to the summit. We returned to Davis Path and continued to Mount Isolation, where we again took the spur path to the summit. We we again returned to Davis Path and this time followed the path to its terminus on the shoulder of Mount Washington where it met Crawford Path. 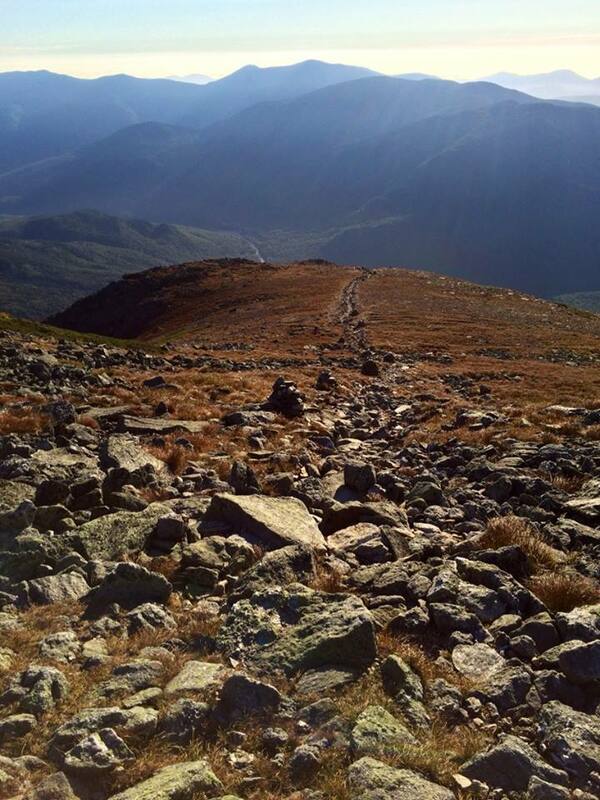 We completed our ascent of Mount Washington by following Crawford Path to the summit. For our descent we followed Nelson Crag Trail until it ended. Finally we jumped on Old Jackson Road and followed it to our other vehicle waiting at the Pinkham Notch Visitor Center on Route 16 in Jackson, New Hampshire. This massive hike was over 21 miles long and included 7100 feet of vertical gain. Not including the time we were sleeping on Stairs Mountain, this hike took almost 13.5 hours to complete. Since March 2015 I had been commuting to work via my Surly Long Haul Trucker. Final, in March of this year I put a down payment on a Toyota RAV4 which gave me and my whole family a lot more flexibility around commuting and other activities. I also bought a THULE Spare Me spare tire bike rack, which I was excited about as it provides a lot of flexibility in my hiking. Bringing my bike with me on solo hikes allows me to do traverses rather than always doing a loop to hike. 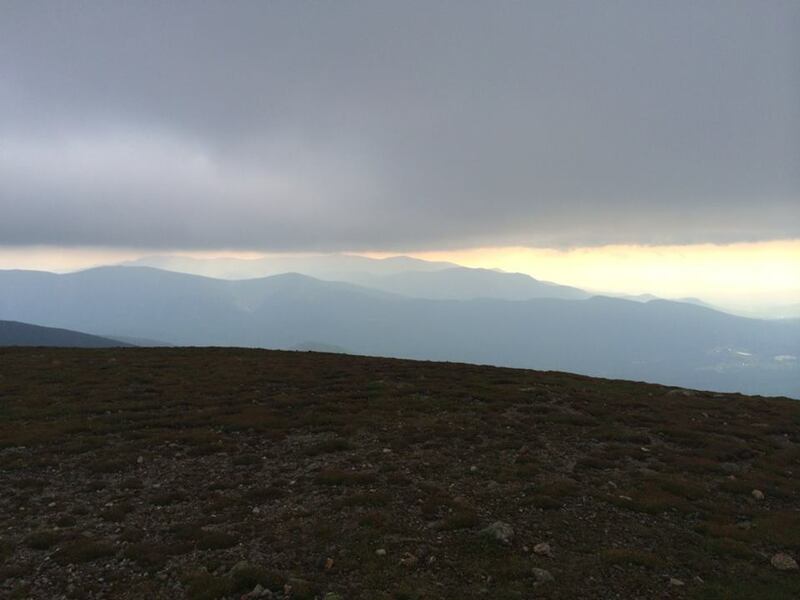 I decided to put this to the test by doing a traverse of the Southern Presidentials. Additionally, a few weekends prior I had wanted to hike Mount Washington and bailed on the idea because of the ice conditions. But this time I borrowed crampons from a friend to make it happen. 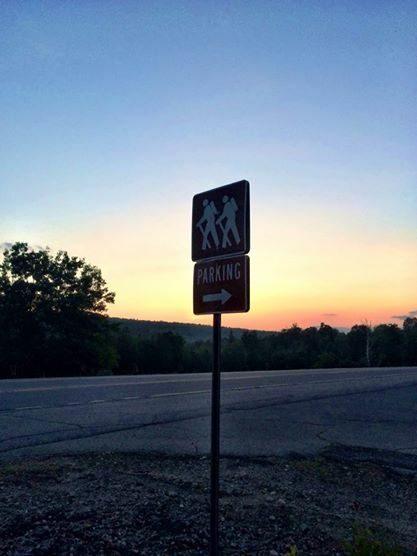 After leaving home at an incredibly early time, I swung by the parking lot on Clinton Road in Crawford Notch at 6:00 am. I ditched my pack in the woods and clambered back into my car. There were only two cars in the parking lot, so that was good. One Sunday in November my friend John and I headed north to the White Mountains of New Hampshire with the goal of climbing Mount Washington. The forecast was favorable temperature- and precipitation-wise, but it was calling for hurricane-force winds on the summit. We got to the parking lot at the Pinkham Notch visitor’s center at 8:00 am. There was some activity center, but it was hard to tell if people were headed up to the summit or not. We gathered our gear and headed up the Tuckerman Ravine Trail. Work stress, home-buying stress and Father’s Day weekend found me pining for the mountains. It had been nearly two months since my last hike, nearly three months since my last mountain summit and seven months since my last solo hike. It was a gorgeous weekend, so I volunteered to take the ferry to town to procure the weekly groceries and then stole to the mountains to get a reprieve. The Baldfaces was one of those hikes that doesn’t make the list of big hikes, but I had heard was one of the better hikes in New Hampshire. So I took the drive to Fryeburg and instead of heading west toward North Conway, I kept north toward Evans Notch. I found the trailhead parking lot overflowing and pulled over on the sandy shoulder and hopped out of the car. I was on a tight time-budget so I threw on my daypack and headed to the trailhead, which was on the opposite side of the road and a few hundred feet north of the parking lot. The 0.7 mile trail to Emerald Pool was very flat and I took it in a few minutes. I popped down to the pool to take a gander and quickly headed away from the small crowd gathered there and toward the mountains. At the spur trail to Emerald Pool was also the intersection with both branches of the Baldface Circle Trail as well as the Slippery Brook Trail. 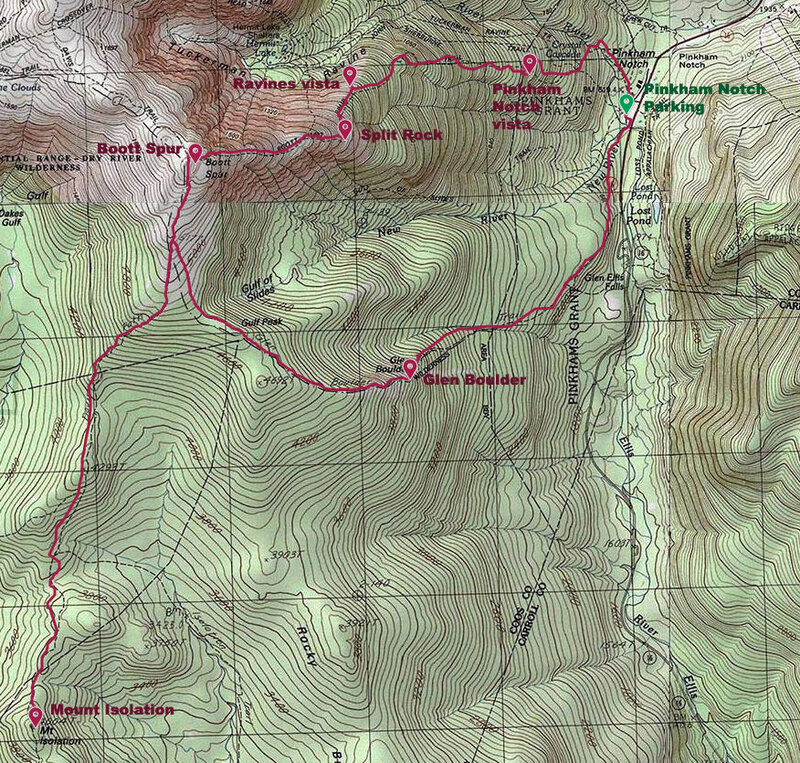 I headed toward Slippery Brook and then turned off to head toward South Baldface via the Baldface Circle Trail. The trail soon became moderately steep and I found the indiscreet Chandler Gorge Loop Trail. I followed it to Chandler Gorge, a small canyon in the forest will a few cascades and pools, and back to the Baldface Circle Trail. 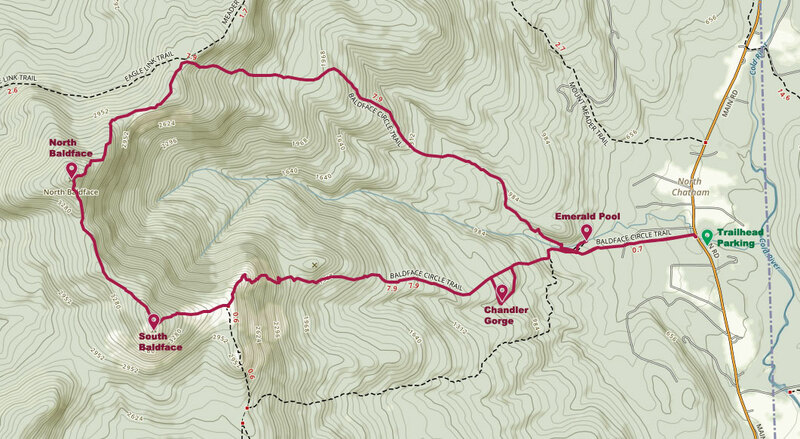 Since I was Red-lining the White Mountain trails I briefly hiked downhill to the junction with the Chandler Gorge Loop trail to bag the section of the Baldface Circle Trail between. A few miles up the trail I hit the Baldface Shelter and sat on the pile of flat stones next to the fire pit for a quick lunch of PBJ and pretzels and pondered over the fact I had seen no one on the trail (aside from the crowd at Emerald Pool). Soon after the shelter the fun began, the trail exited the forest and hit a section of bald granite with cliffs looming above. I picked my way carefully over the boulders and in several places I had to pull myself up short rock faces. It was actually one of the more difficult sections of trails I have hiked in the White Mountains and would definitely not be fun in bad weather. Apparently this section of trail can be skipped if you take the Slippery Brook Trail and Baldface Knob Trail instead, but I was up for the challenge. A couple of times I had to pause and search around for the trail, neither the blazes painted on the granite nor the cairns were obvious or frequent. I was able to find my way based on the wear from trekking poles and soon found myself on the crown of granite for which the Baldfaces got their name. The trek from there reminded me of hiking up Bondcliff for whatever reason: I suppose because of the spectacular view, the exposed rock and the lack of underbrush. Soon thereafter the ridge leveled off at the junction with the Baldface Knob Trail and was crowned with an enormous cairn and a wonderful view up to South Baldface summit. The climb from there to the summit was similar to the Boott Spur Trail: mostly exposed but fairly steep and occasionally dipping in and out of the trees. As it approached the summit, the trail entered the trees but surfaced from them again just prior to the summit. I paused to look back toward the baldfaced ridge before hitting the peak. There were several small groups of people gathered around the spacious summit, so I made my way to the south and found some shade beside a large boulder. It was my brother’s 40th birthday and a few days after the birth of his 3rd child so I made him a short video of the summit, including a shot of one of the greatest mountains we’ve stood on top of together, Mount Washington. 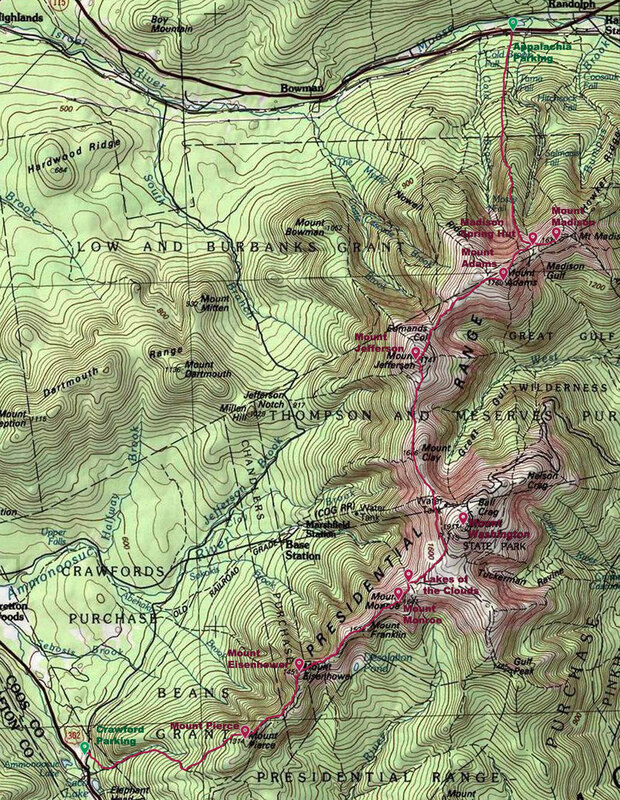 I began the hike north toward North Baldface and the trail took me into the trees again. 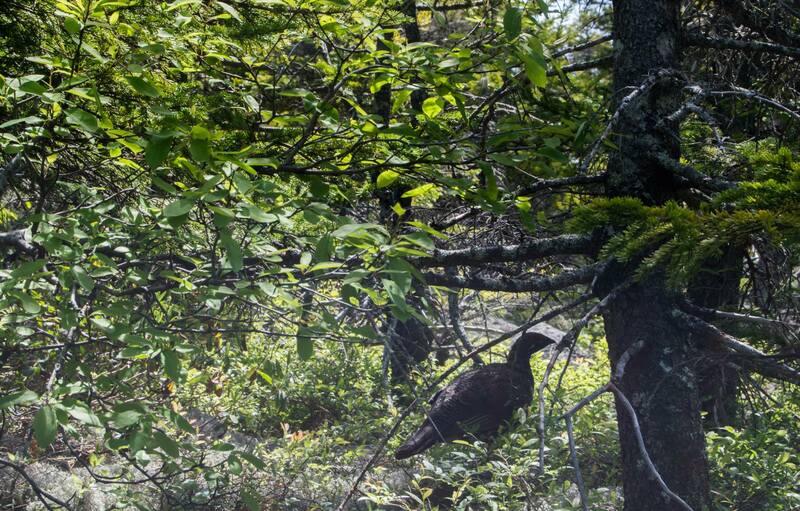 Soon after the summit I came upon a spruce grouse in the trail. I slowly walked up to it and came within a few feet before it darted off the trail. It stood frozen as I approached it again, probably suspecting that I could not see it if it held still for long enough. I watched it for several minutes until a couple of hikers came down the trail toward me. I pointed out the grouse to them and started on my way. The hike from the col between the mountains up to North Baldface was very rigorous. I was quickly soaked with sweat and breathing heavily but pushed on. I’ve hiked with several people who have said they were near vomiting while keeping up with me. I don’t think I’m the fastest hiker, but I do like to push through hard climbs. To me it is a workout that cleanses the body of the cruft which gathers from the nine-to-five life. Halfway up to the northern summit I came across a large group of college-age guys and ladies as well as a dog. The dog was sprawled out taking a breather and trying to dissipate as much body heat as possible into the ground. Several of the guys were as well. I uncharacteristically made a few jokes about how the dog looked how I felt and bid them farewell. Arriving at the summit there was a decent view to the south which was intensified by the haze in the air, but the Presidentials were cloaked by the Carter-Moriah Range. Again there were several groups of people scattered about. I wolfed down my second PB&J as well as an orange and began my descent as the large group of college-age folks were taking the summit. The hike from North Baldface toward Eagle Crag was an interesting one. It weaved through the trees and out onto bald rock intermittently, similar to Bamforth Ridge on Camels Hump in Vermont. One of the highlights for me was the spectacular view of the bald ridge and ragged cliffs on the east spur of South Baldface (which I had climbed a few hours earlier). Once the trail hit the junction with Eagle Crag Link it entered the trees and headed for the trailhead. The trail was steep at first but gradually leveled out until the final flat mile heading from Emerald Pool to the road. Once I hit that section I also hit the crowds. It seemed that many of the vehicles that were overflowing the parking lot belonged to people going for a cool dip in the pool. The hike up to South Baldface was an impressive one and one I will likely do again. 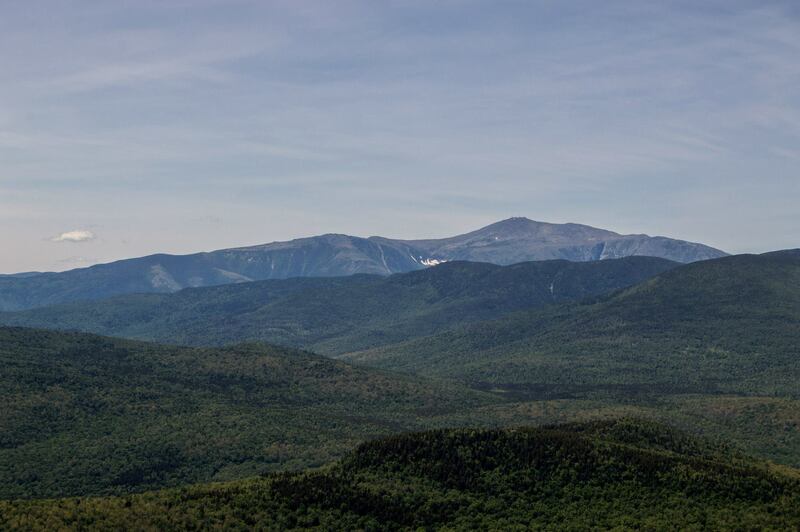 Next time I will probably do a loop of Slippery Brook Trail, Baldface Knob Trail and South Baldface so that I can check out Baldface Knob, which looked interesting from above. The block of granite which was an obstacle in the pathway of the weak, became a stepping-stone in the pathway of the strong. “Spruce Grouse.” allaboutbirds.org. Cornell University. Web. 10 September 2015. Mount Isolation is one of the more difficult 4000 Footers to reach, not because of its elevation but because it is far from access points and there are no real direct trails to it. Hence its name. From my research I found there were two common routes to Isolation, via Rocky Branch Trail or via Glen Boulder Trail and Davis Path. Rocky Branch was the easier route but was longer and didn’t afford views. 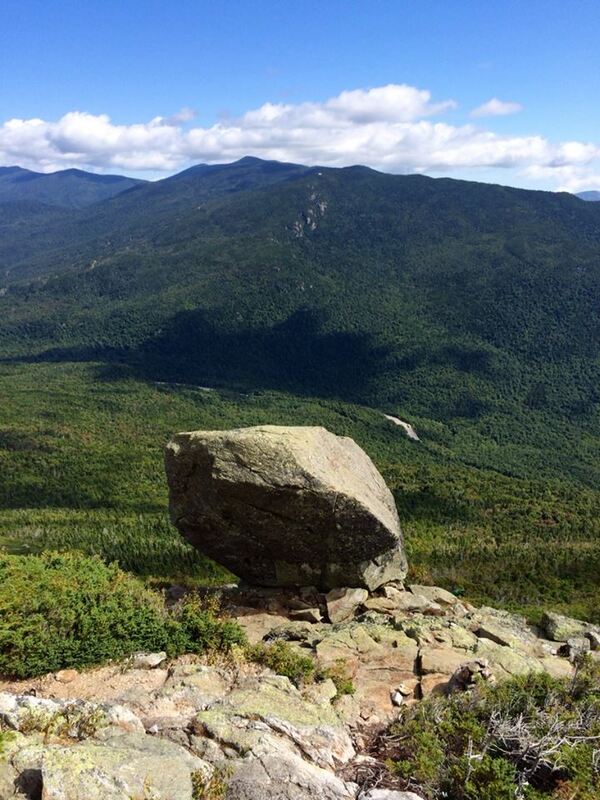 Glen Boulder had exquisite views but reaching Isolation that way meant climbing the shoulder of Mount Washington twice. Since I decided to camp at Dolly Copp Campground the night before attempting Isolation, I thought I’d step it up a notch. 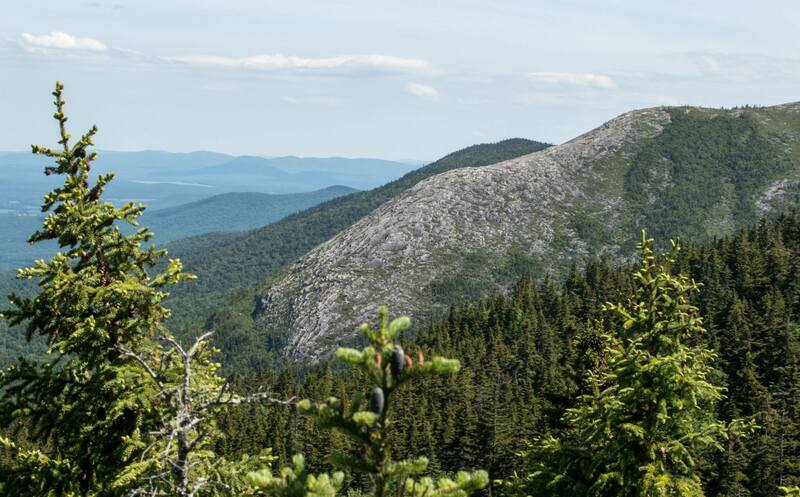 I would take Boott Spur Trail (higher up on Mount Washington’s shoulder and further from Isolation) and Davis Path to Isolation, and return via Davis Path, Glen Boulder Trail and The Direttissima. I got up at 4am in order to get to the trail by 5am. I had to start in the dark but it afforded plenty of daylight for the massive hike. I got to Pinkham Notch soon after 5am and headed into the section of the lodge that was open 24 hours. I signed into the log book but could not find a place to pay for parking. Knowing that I would be heading back to Pinkham Notch via The Direttissma, I had parked on the far southern end of the parking lot and decided to start the hike without paying. I would straighten things out when I got back if I had to. I started up the Tuckerman Ravine Trail with my headlamp, almost tripping over the tent of someone camped in the trail. Soon, the Boott Spur Trail diverged left and started to climb through the forest and over boulders. As I got to the first vista the sky had lightened enough to put away my headlamp. 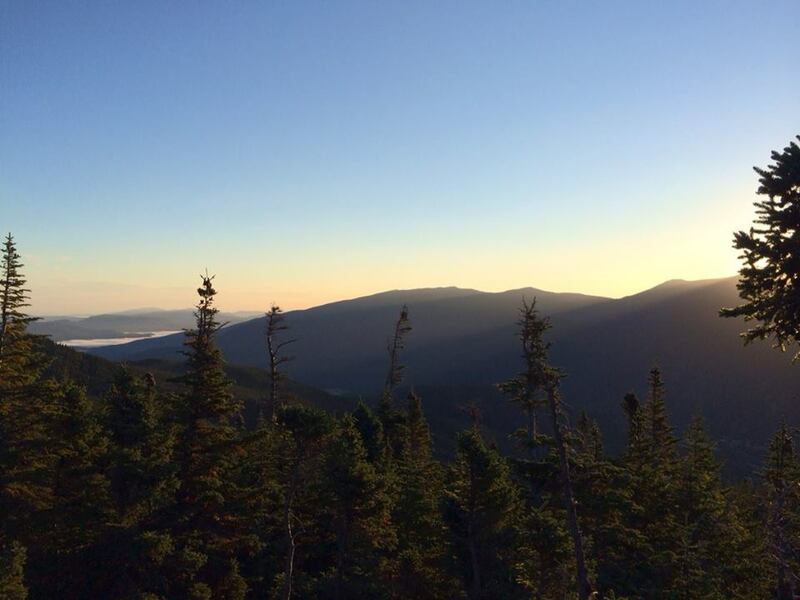 I was stunned by the view of the Mount Washington’s massif. 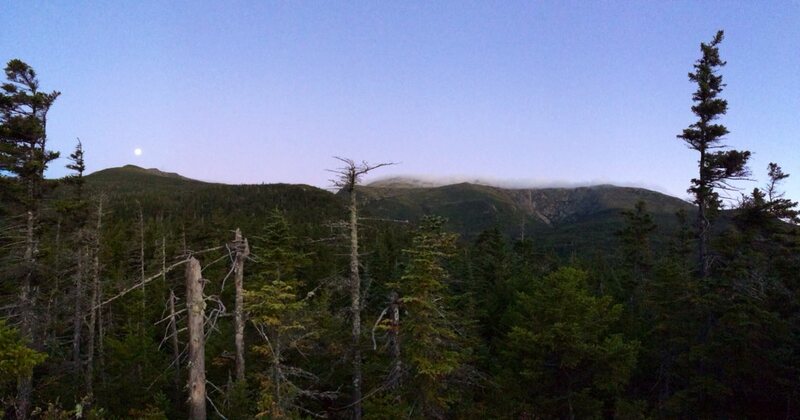 I got my first good glimpse of Huntington Ravine, the moon was just starting to set over the top of Boott Spur and morning mists shrouded Mount Washington Observatory from view. Further up the Boott Spur Trail I had a view of the Carters across the notch just as the sun rose above their peaks. 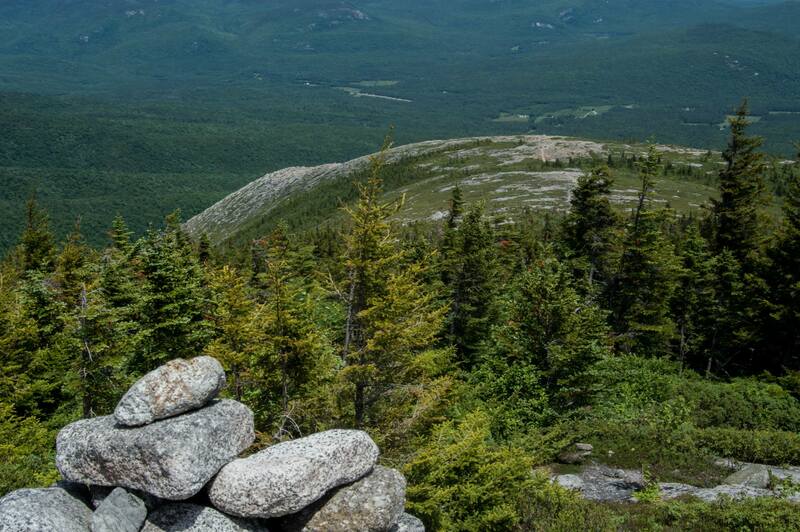 I came to a spur trail that lead to an amazing vista over both Tuckerman and Huntington Ravines. It was an incredible view of the ravines that I really hadn’t witnessed before. 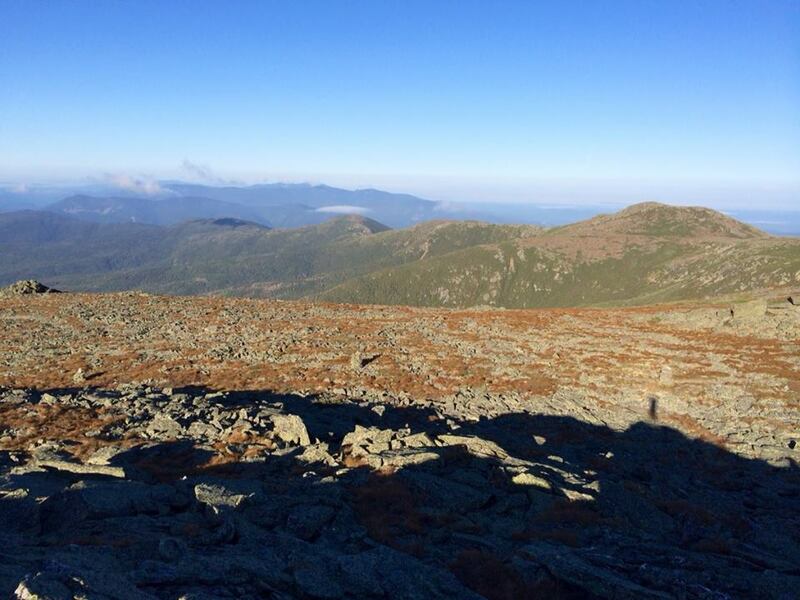 I had done most of my hiking of the Presidential Range from north to south, passing Mount Washington on the west. It had been cloudy when I climbed Wildcat D, and the Carters and Wildcat A hadn’t had a view of Washington. I stood for several minutes just staring at the baffling scenery. As Boott Spur Trail climbed, it got on top of the ridge and opened up views to the south. I could see Glen Boulder perched on the next ridge and beyond it to the valley where North Conway sat. I came upon Split Rock and climbed through it even though the trail stayed to the right. After Split Rock, the trail turned into a series of steep climbs and plateaus, creating many false summits but providing momentary breaks from the elevation gain. The view back down the trail was spectacular. 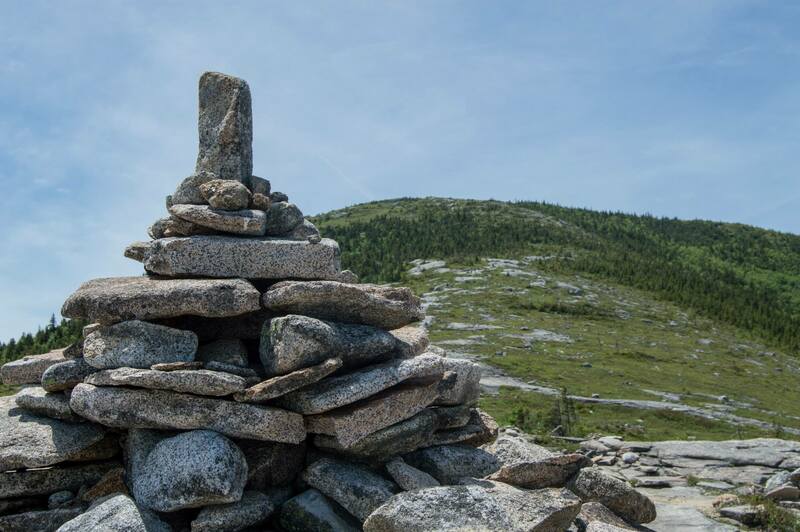 At the top of the trail, with Davis Path’s cairns in sight, I rock-hopped off the trail to the top of Boott Spur. To the north I got a crazy view of Tuckerman’s Ravine, Mount Washington and Alpine Garden. To the south I had another marvelous view: the Southern Presidentials marching down to Crawford Notch. I made my way back to Boott Spur Trail and finished off the last hundred feet or so. I turned left down Davis Path and made good time descending toward the Dry River Wilderness. The trail was the typical, amazing Presidential alpine trail; a narrow rocky gash through surrounding scrub on top of an unprotected ridge. I came to the edge of the Dry River Wilderness and then dropped down into the forested mountains below. Davis Path continued on through the forest, where there were many signs of the damage done by tropical storm Irene in August 2011. The trail was narrow and overgrown, showing that not many people travel the route, and in many places I had to duck under pine trees that were leaning over the path. When I came to the intersection with the west branch of the Isolation Trail there was a notice that it was closed from the damaged done by Irene. When I got to the intersection with the east branch of the Isolation Trail there was another warning that the Rocky Branch Trail south of Rocky Branch Shelter #2 was also closed. It appears that at the end of September 2014 the Dry River Trail and the Isolation Trail have been reopened but are more rugged and harder to follow than previously. I have found no evidence that the Rocky Branch Trail has been reopened at the time of this writing. A mile after the intersection with the east branch of the Isolation Trail, I came to the spur trail to the summit of Mount Isolation. 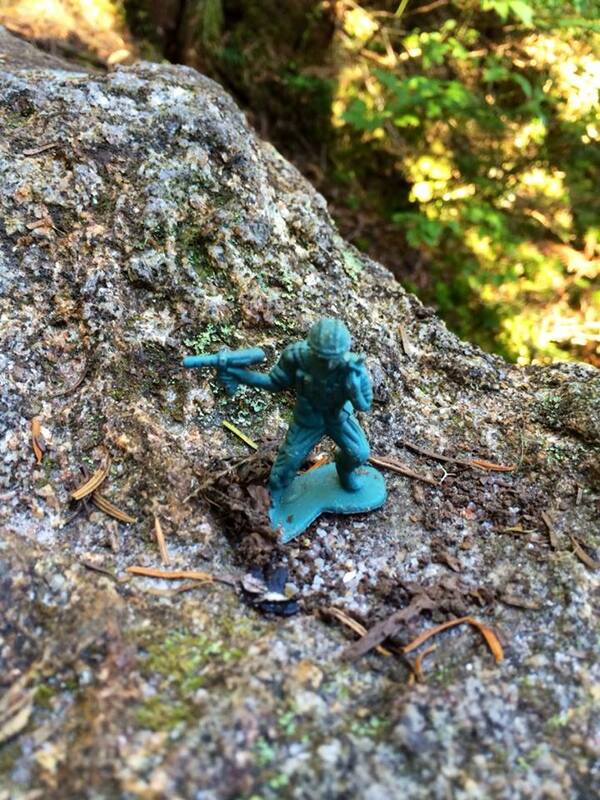 It was a short climb to the summit and luckily I had an army soldier to point me in the right direction. Isolation had a clear, ledge-topped summit with an open view of the southern Presidentials. Unfortunately, on that mid-week, early-September day the mountain did not live up to its name. There was a family camping in the trees just beyond the summit. I found Isolation not so isolated. The family had a young boy, 8 years of age I would guess, who followed me around and kept stating: “fine day for a hike, isn’t it?” Indeed it was. We talked for a few minutes before his mother called him back. 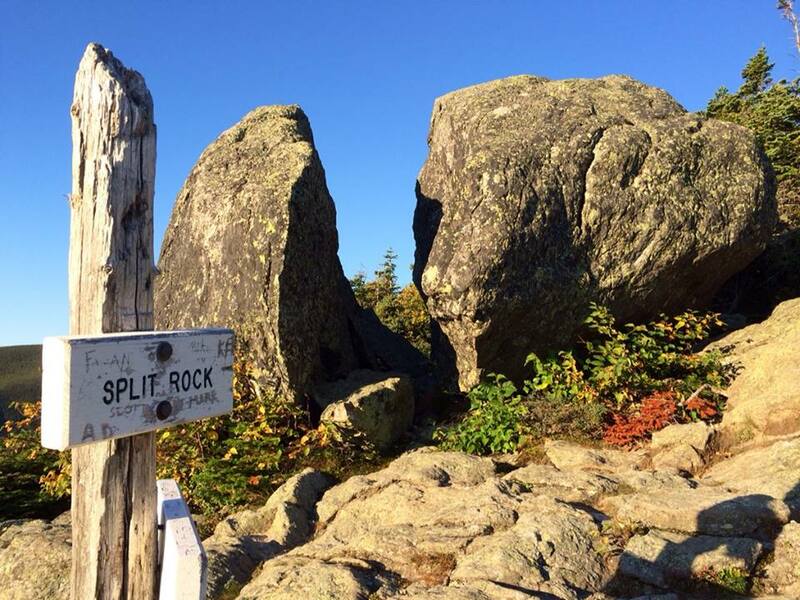 It turned out that Isolation was his 47th New Hampshire 4000 Footer and his favorite. I didn’t get the chance to ask him which mountain was remaining. I would guess it was Owl’s Head, the other out-of-the-way summit. As the family was packing up their gear, I decided to hit the trail ahead of them. I could have waited for them to leave and have the summit to myself, but it might have turned out to be a long wait. The hike back through the woods went by quickly and I soon found myself climbing up Mount Washington’s shoulder again. I toughed it out and took a break at the intersection with the Glen Boulder Trail. The upper part of the Glen Boulder Trail would have been inspiring if not for being overshadowed by my hike up Boott Spur Trail that morning. It had some great views but dove into the trees much sooner than Boott Spur. As I headed down the trail I started to run into the day hikers who began their hikes at a normal times. I would start my hike in the dark any day just to beat the crowds to the trail. I eventually got to Glen Boulder sitting precariously on the edge of the trail. Someone had comically wedged some three-inch-long twigs into the crack between the boulder and the ground, as if they were the only reason it was resting in place. 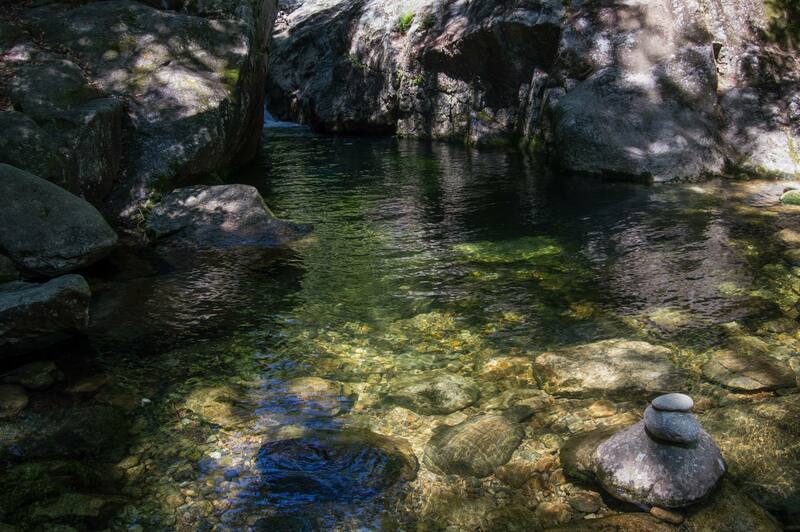 I remembered back to my first visit to Glen Boulder. It must have been back in 2000, the year that my wife and I got married. We took a trip up to the White mountains, drove up Pinkham Notch, climbed to Glen Boulder and back, and then looped around the Presidentials, making our way back to Route 302 and back to Maine. It had been the first time in recent memory that I had hiked above treeline. As I stood with my wife next to Glen Boulder and looked at the highway far below I realized that I loved hiking. It was a good decade before that feeling matured into the drive that possesses me to continuously hit the trail today, but on that day it was birthed. The rest of the hike was a typical White Mountains descent: big, knee-busting steps down boulder-strewn trail. Once Route 16 was in ear-shot I found the junction with The Direttissma. The trail was a narrow one full of pointless ups and downs that followed the highway north for a mile until a parking lot on the south side of the New River, just below the Pinkham Notch parking. I crossed the bridge over to my car, wishing I had known The Direttissma had its own parking lot so I hadn’t worried about parking all day. With that thought I made my way through the buses of camp children and senior citizens to the Visitor Center where I bought a year pass to the White Mountains. I wouldn’t have to worry about parking for a while. The goal of this hike was three fold: to push myself and see how big of a hike I could do solo; to get one of the more difficult 4000 Footers out of the way; and to get some solitude. All goals were achieved even though I found Isolation to be occupied. Boott Spur Trail ended up being one of my favorite day hikes. The weather was perfect, I didn’t see another soul on the trail and the vistas were phenomenal. “2 trials damamged by tropical storm Irene reopen.” seacoastonline.com. Local Media Group, Inc. Web. 5 October 2014. 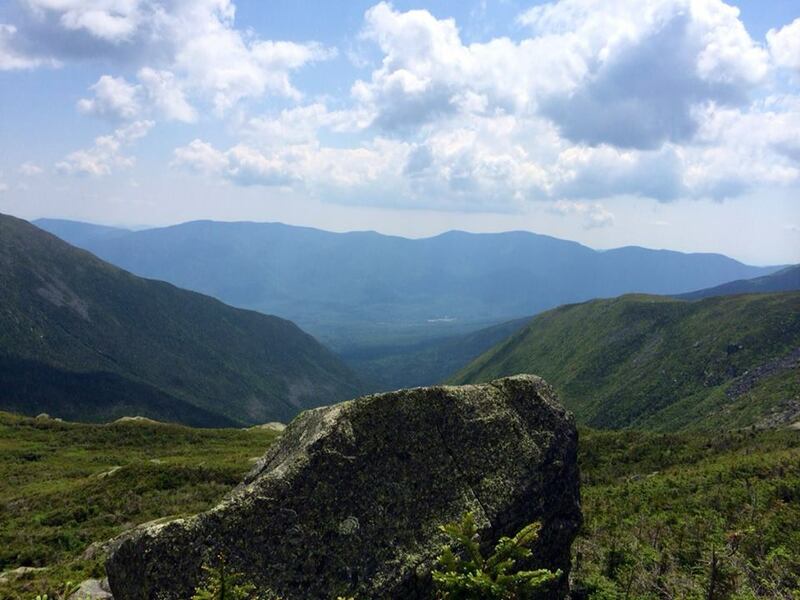 “Hiking Mount Isolation, NH.” home.earthlink.net. EarthLink.net. Web. 29 September 2014. “Hurricane Irene Hammers the Northeast.” weather.com. The Weather Channel, LLC. Web. 5 October 2014. “Recreation Pass Overview.” fs.usda.gov. Forest Service: US Department of Agriculture. Web. 5 October 2014. 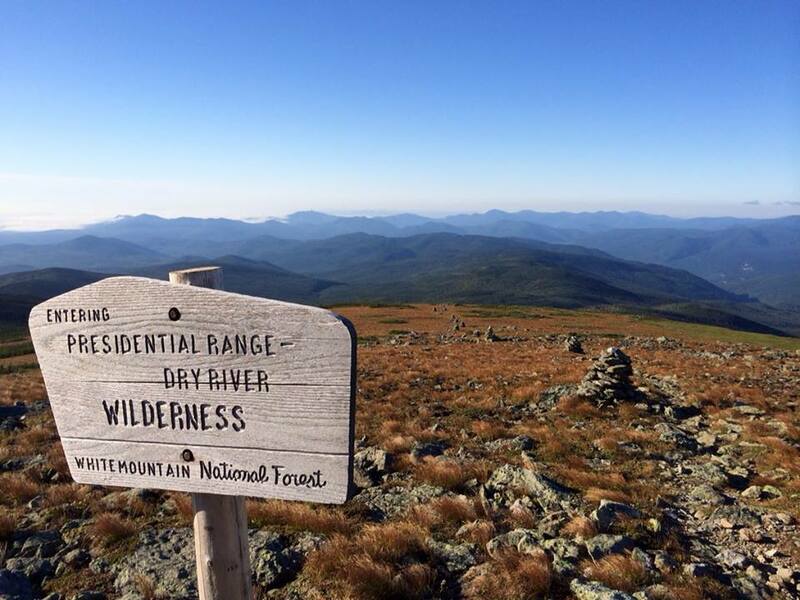 One of this year’s big hikes for me was a one day attempt at the Presidential Traverse, a hike across the Presidential Range in the White Mountains National Forest. 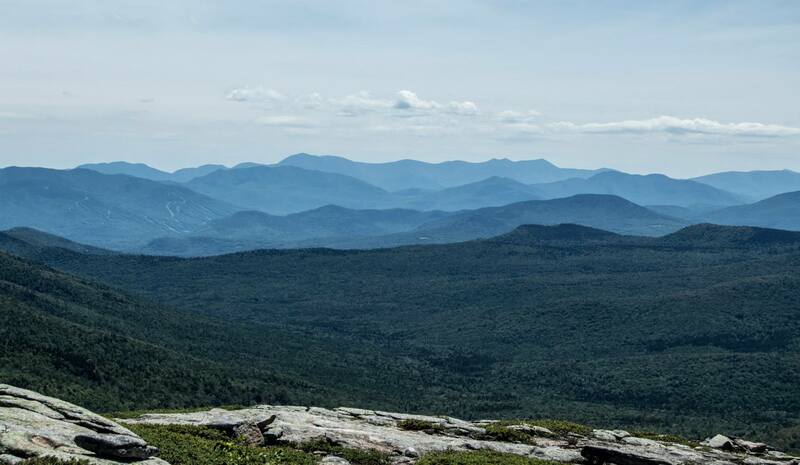 The hike typically consists of summiting all of the peaks that are named after presidents, though there are other variations which include the other peaks along the range. A friend from work and my brother joined me on this hike. We decided to tackle the traverse from north to south to get the big and strenuous mountains out of the way and to just do the classic version of the traverse: Madison, Adams, Jefferson, Clay, Washington, Monroe, Eisenhower and Pierce. We arrived at Appalachia parking lot at 5:00am as the sun was rising. We chose to summit Madison via Airline Trail rather than the more typical Valley Way as I had hiked it just two weeks before when I climbed Mount Madison with my son. Airline did not seem more difficult than Valley Way, though it was definitely more exposed. Where Valley Way climbed gradually into its steep elevation gain and became more difficult near the top of its trail, Airline got the elevation out of the way earlier and once it climbed out of the trees and onto the ridge it leveled off some. I was also excited to take Valley Way as I heard that from the Knife Edge, a section of narrow trail on the ridge, you could see one of the best examples of the difference between a glaciated valley and a valley carved by running water. The ravine had steeper walls and a bowl shape at the bottom and the valley was v-shaped with more gradual slopes. After enjoying the spectacular views at the top of Airline we stopped at Madison Spring Hut where my brother rested while we climbed Madison. Even though I had recently climbed it, I still enjoyed the rocky climb up to Madison’s peak. As apposed to two weeks ago, the weather was clear and the view of Adams, Washington, the Wildcats and Carters was magnificent. After climbing down Madison we headed up Adams. I’ve always enjoyed climbing Adams, though it and Jefferson always seem to burn me out. The talus of Adams was spectacular but I could already feel my energy waning. We continued on past Thunderstorm Junction and the bizarre terrain between Adams and Jefferson. We stopped for a break at Edmands Col so that a large group of hikers could get far enough ahead of us that we wouldn’t have to pass them on the steep climb to Jefferson’s peak. Like Adams and Madison, Jefferson was a strenuous hike up rocky terrain. Jefferson was always my least favorite of those behemoths due to its many false peaks when climbing it from the north. We took a short break on the summit and then pushed on ahead of the large group that had climbed up before us. At Sphinx Col we stopped and were greeted by a United States Forest Service volunteer wielding a large GPS unit. He said they were collecting data on hikers and asked us where we had started hiking and where we were going. We asked him how high the climb to Clay was and he said about 700 feet, roughly the same as the climb down from Jefferson. The night prior to the hike we had agreed that we would bypass Clay as we had all done it before and it was not an official 4000 Footer. Halfway around Clay we started discussing the pros and cons of bypassing Washington as well. It was already past noon and we hadn’t hit our halfway mark and none of us were thrilled to make the push to the summit and be greeted with buses and crowds. My only reluctance was that I was depending on the cafeteria on the summit to provide my big meal for the day. All I had left for the day were two Clif bars and two small packets of peanut butter. But, since the others would be able to get food at Lakes of the Cloud, they could spare me their Clif bars if needed. Once we got around Clay and started the hike toward Washington we took Westside Trail under the cog railway and around Washington. Westside Trail was enjoyable as I had never hiked it before. We had good views down into Ammonoosuc Ravine and had a different perspective of Lakes of the Cloud. I started to bonk on the descent to Lake of the Clouds and the southern Presidentials, but one of my packets of peanut butter got me to the huts. Along the way we passed another US Forest Service volunteer counting people hiking between Washington and Lakes of the Cloud. We took a short break at Lakes of the Cloud. I ate my other peanut butter packet and a Clif bar and refilled my water. We had hit the crowds again, it had been quiet since we bypassed Clay and now people were milling about everywhere. There were boy scouts running through the alpine grasses and a tired man with his son and dog trying to convince the hut croo to let him stay in the Dungeon, the hut’s basement. He didn’t think they could hike back down before dark and there were afternoon thunderstorms in the forecast. There was also a young family with several kids, the dad was hiking with one of the kids in a Cadillac-sized carrier on his back. Rugged. We picked up as the tired father and son got permission to stay in the Dungeon and pushed toward Monroe. Monroe, Eisenhower and Pierce were new mountains for my brother. When we attempted the Presi Traverse in 2012 we got trapped in a thunderstorm. When it had a cleared a bit we bypassed Monroe and took Edmands Path to Pierce road. I enjoyed the climb up to Monroe, the headwall on the north side is a fun little scramble and the view looking back toward Washington is amazing. We descended Monroe and enjoyed the long flat hike between Monroe and Eisenhower. We passed the Mount Franklin spur path and continued on toward Eisenhower, not wanting to add any unneeded climbs. Clouds were starting to roll in pretty heavily once we got to Eisenhower, but we were below their altitude at that point. On top of Eisenhower the clouds formed a perfect crown just above its summit. After Eisenhower we made the trek to Pierce, popping in and out of the treeline. This was usually an enjoyable section of the trail, but I was so worn out at this point that each time we went above the trees it felt like we were no closer to Pierce. We finally hit the junction with Webster Cliff Trail and dropped our packs. The hike up to Pierce was easy and short. We stopped for a few minutes, my brother and I drank celebratory beers we had carried the whole way but the black flies kept us from resting for long. The hike down Crawford Path was like most descents after a big hike: long and arduous. We hit the parking lot at Pierce Road at 8:30pm, about fifteen and a half hours after we started. We had bypassed Washington, but all agreed that it was a successful hike. At the time I had said I was done with the Presidentials for a while, especially the northern peaks. But now I want to attempt the hike again, including Washington. I guess it will have to wait until next year as the days are getting short. “A glacier carves a U-shaped valley.” nature.nps.gov. National Park Service, et al. Web. 15 August 2014. “Great Hikes: A Presidential Traverse.” sectionhiker.com. Fells Press LLC. Web. 14 August 2014.